This is a wine that'll impress your friends. From one of the original McLaren Vale pioneers and Wine Advocate's 94 point vintage, it contradicts the region's rep for over-the-top, high-alcohol wines; translating to sheer elegance in the glass and massive value for the wallet. 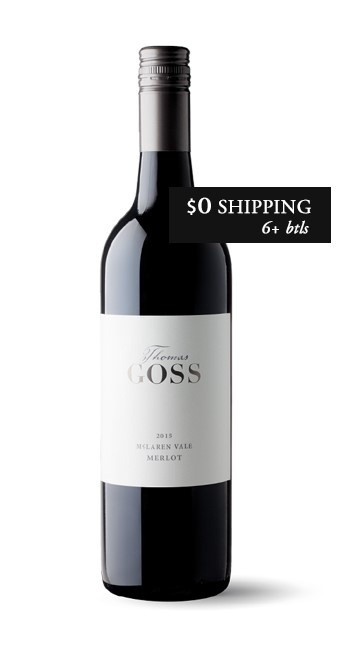 The 2015 Thomas Goss Merlot—named after a British colonist and one of McLaren Vale’s agricultural pioneers—is a medium bodied, stylish red full of finesse and dare we say it… restraint. This Merlot was sourced from vineyards thriving on the original Thomas Goss property, one of McLaren Vale’s oldest. Handsomely endowed with red berry fruit lifted by piquant spice and bright acidity, this Merlot owes its delicacy to the nearby Gulf of St. Vincent and the cool, saline breezes blowing, nearly constantly, over the vineyard. Enjoyed with food, this Down Under wine is eerily similar to the Merlot-based Bordeaux wines of Pomerol and St. Emilion. · Englishman Thomas Gross immigrated to Australia with wife Mary and their children back in 1849, making Gross one of McLaren Vale’s true pioneers. · The future grape farmer found initial success in Australia’s version of the Gold Rush, which occurred at the very same point in history as the California Gold Rush. Gulf, which helps to moderate temperatures during the growing season. The Merlot grapes used to make this wine have been sourced from vineyards planted on the original Goss property in McLarenVale. With dominant winter rainfall, warm, dry summers that are tempered by the proximity to the Gulf St. Vincent and low humidity, McLaren Vale has one of the most consistent climates in which to grow premium wine grapes.You'll notice some fruit flavors such as plum and red berries in the wine. You'll also find that the savory tanins and spices contribute to the well-rounded and palate friendly flavors. This will pair nicely with a variety of meals, but we recommend trying it alongside any pasta or red meat dish. A perfect complement to pasta dishes too.